The ceilings in the Baths of Caracalla were varied and incorporated all of the possible ceilings known to the Romans: the dome, the semi-dome, the barrel vault, the groin vault, and the open ceiling. 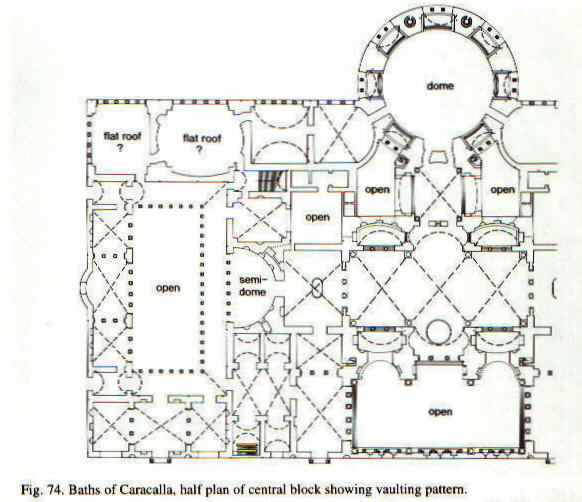 As you can see from the layout, the Baths were never consistent in ceiling style and its architect (who is unknown) enjoyed exploring his abilities with all types of ceiling systems. The dome of the caldarium, along with the groin vaults of the tepidarium and frigidarium, were highly decorated in either painted stucco or glass mosaics. As none of the remains from these ceilings survives to this day, we can only guess as to the opulence one would view while looking up into the heights of the ceilings.